Lisa Bakerink, Lexi Saner and Ric Mayer of Friends of the Garden. 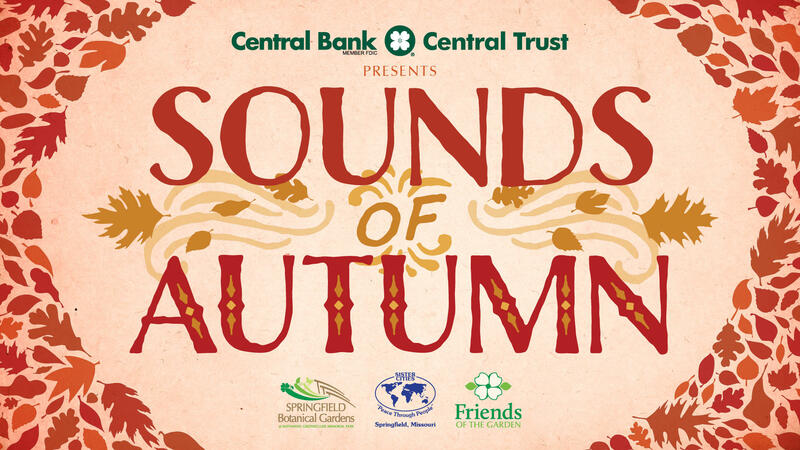 Friends of the Garden presents "Sounds of Autumn," a free concert series Sundays at 2:00pm in October at Springfield Botanical Gardens. “Sounds of Autumn” features a variety of local performance groups, according to Ric Mayer. "As it happens they are all local music people. We've brought (performers) from as far away as New Zealand--and we'll bring them back. We had some nice people from over there." But for this series the organizers were eager to let local musicians "show their particular talents and their singer/songwriting skills. This is our fourth year actually--we called it 'Americana and Roots in the Gardens', which is a LONG name! Now it's 'Sounds of Summer' and 'Sounds of Autumn.'" Mayer wanted to emphasize that although admission to the concerts is free, "while we have everyone gathered together we usually pass the hat around. We're trying to get a wheelchair- and stroller-friendly trail through one of the gardens." Bring your own lawn chairs and/or blankets for seating. In the case of inclement weather, the concerts will move inside the Springfield-Greene County Botanical Center. "It's a beautiful day in the park--beautiful spot in the park, actually. I mean, you can't beat it." And if it rains, Mayer said, "the weather's always nice in the Botanical Center!" Lisa Bakerink talked about the "unique relationship" between Friends of the Garden and the Springfield Sister Cities Association, specifically with the Mizumoto Japanese Stroll Garden and the Peace Through People Pavillion. The latter venue, said Bakerink, "is just two years old this October. It is a major addition to the Garden. We also partner on trips to share cultural exchanges with our Sister Cities in Tlaquepaque, Mexico and Isesaki, Japan. So we have a very strong partnership, and we are so grateful to Central Bank and Central Trust for making this concert series possible." Molly Healey | Sunday, October 7 at 2:00 p.m.
Molly Healey is a violinist/fiddle player, cellist, and singer-songwriter. Her solo work features a looping effects pedal that allows her to record herself and play multiple lines at one time. Casey and the Atta Boys | Sunday, October 14 at 2:00 p.m.
Casey and the Atta Boys is a bluegrass band featuring Casey Freeland on the bass, Kelly Freeland on the guitar, Andrew Morton on the fiddle, and Justin George on the banjo. Shaun Munday | Sunday, October 21 at 2:00 p.m.
Shaun Munday blends soul-drenched vocals with show-stopping bass guitar technique. He captures audiences with a full band sound and plays the bass better than most people play a guitar. Dallas Jones | Sunday, October 28 at 2:00 p.m.
Dallas Jones is a folk rock singer-songwriter born and raised in the Ozarks. He has eight studio albums and more than 300 original songs to his credit. For more information, visit www.friendsofthegarden.org; email info@friendsofthegarden.org; or call 891-1515.